The theme of this year’s CHESS was Gender and Indigenous Landscapes. I must admit, though, I was hoping for one thing: maize fields. Which is how it happened that on our Thursday afternoon visit to the restored Wendat village at Crawford Lake Conservation Area I found myself inspecting a large stone and reflecting on what we leave behind. No maize fields survive at Crawford Lake; there is only this stone, that archaeologists believe was used for grinding maize. At CHESS we were challenged to take seriously the acknowledgements of Indigenous land that have become common, and often somewhat rote. The Wendat were an agricultural people; they reshaped landscapes for food production. These landscapes have been obliterated and at Crawford Lake, anyway, have not been restored. How does this reality shape our ability to truly acknowledge Indigenous lands? Or more specifically: what happened to the maize fields? I asked our guide this question. Crawford Lake features a variety of spectacularly restored Wendat longhouses, but no trace of the fields of maize — and beans and squash, the famous “three sisters” (or as artist and elder Bonnie Devine said in our opening keynote address, the “three sustainers”). Iroquoians grew the three sustainers by shaping the earth into mounds, and planting the three crops together. Samuel de Champlain, travelling through what is now New England, described fields that stretched to the horizon. Others reported fields so large they were in danger of getting lost. 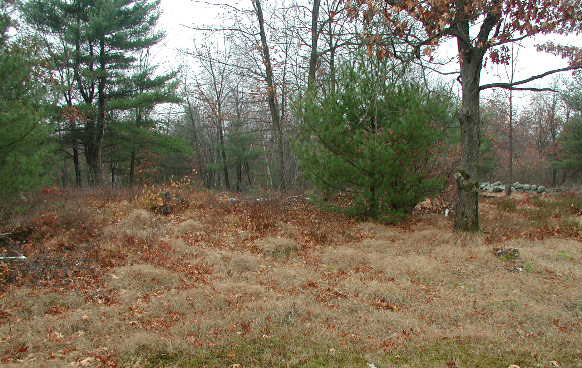 A few remnant fields of mounds survived in New England at least into the early 20th century. Yet the restored longhouses at Crawford Lake were largely surrounded by grass and forest. Our guide explained, echoing the arguments of Ontario archaeologists, that the mounds had not survived the years of neglect and especially years of plowing and replanting by Euro-Canadian settlers. There was, though, the stone. Likely an outcropping of the underlying bedrock, the various bowl-like depressions in its surface were the result, it is thought, of Wendat women grinding corn. What is more, it likely lay on the edge of the former fields of the Crawford Lake village. In fact, in the original archaeological report on Crawford Lake, this stone was one of the landscape features that convinced scholars that this was a site worth excavating. Another was evidence of maize pollen in sediments at the bottom of Crawford Lake. I struck off to see the spot, just outside the reconstructed palisade (historically inaccurate, our guide explained, and in the process of being taken down) where the stone lay. I was fascinated. In this spot, I thought, Wendat women might very well have stood grinding corn. But: why grind corn here? Corn was dried in the longhouses. Why haul it from the fields, past the grinding stone, and then back out to the edge of the fields for grinding, and then back to the longhouses for storage? And why, come to think of it, had no evidence of the fields survived? On the surface, the explanation of our guide, and of archeologists in general, made sense. Yet, as geographer William Doolittle has pointed out, England is one of the most reworked landscapes in the world, yet the evidence of medieval agriculture is clearly evident on the land in the form of series of long ridges. Some remnant maize fields do seem to have survived. Perhaps, as Doolittle suggests, we have just not been looking hard enough? At CHESS and at the Annual Meeting of the Canadian Historical Association that preceded it, two themes continually came up. One was the importance of recovering and making known the history of marginalized groups in order that justice be done in the present. The second was land acknowledgements. In North Bay, Ontario, where I live, land acknowledgements are relatively straightforward. The Nipissing have been here for a very long time. In Toronto, I was struck by land acknowledgements that named the Mississaugas, the Wendat and the Haudenosaunee, thus suggesting, while not really acknowledging, the long history of sometimes bloody conflict between these people over this place. So I was pleased that land acknowledgements and their complexities kept coming up as a theme at CHESS. Historian Thomas Pease stated that land acknowledgements should be relational. This idea was elaborated on by York University’s Deborah McGregor, in a fascinating talk on Friday at New Credit of the Missassaugas. “Who you are,” she stated, “really matters” in making land acknowledgements what they should be: not the rote statements that they are increasingly in danger of becoming, but genuine attempts to understand the relationship between land and people. And yet if museums and historic sites are meant to help in this, they are hampered by the disappearance of the land. The Wendat at Crawford lived on the edge of large fields. These are gone. The efforts of the Six Nations community to restore the Mohawk Residential School are heroic. But they appear to be focused on the buildings; the fields where the boys worked are no longer there. My point is not to criticize these historic sites and the work people are doing at them, but to point out that what we leave behind, and what we choose to restore, matters. This becomes evident when you go out to look at what’s out there, as CHESS does every year. We restore buildings. But the rural world in which many people lived in the past is more elusive. Standing in front of material traces of an agricultural past, like the grinding stone, led me to questions I might not otherwise have asked. Just how did Wendat women grind corn? Who hauled it, and how did they do it? Did they grumble about having to haul it in from the fields and back out again? Or are we wrong about the grinding stone? I’ll have to see if I can find out. Edmund B. Delabarre and Harris H. Wilder, “Indian Corn-Hills in Massachusetts,” American Anthropologist New Series, 22, no. 3 (1920): 203-225. See Stephen G. Monckton, “Plants and the Archaeology of the Invisible,” in Before Ontario: The Archaeology of a Province, eds. Marit K Munson and Susan M. Jamieson (Montreal & Kingston: McGill- Queen’s University Press, 2013), 132. W.D. Finlayson and M. Matson, “The Archaeology of the Crawford Lake Site,” in Report on the Investigations at Crawford Lake, assembled by John H. McAndrews, A. Roger Byrne and William D. Finlayson (Toronto, 1975), 3. William E. Doolittle, “Agriculture in North America on the Eve of Contact: A Reassessment,” Annals of the Association of American Geographers 82, no. 3 (September 1992): 395.